A few years ago buying a mattress on the internet was almost unheard of, but fast forward to today, and there are dozens of companies offering this service to save you both time and money while not comprising the quality of your sleep, and in most cases enhance it. The increasing number of these companies and mattresses has made it harder to make a final purchasing decision. A mattress is a vital part of your overall health, and you'll spend a large percentage of your life sleeping. We’ve created this Hyde and Sleep mattress review to help you decide whether this is the correct choice for you as we analyse the company itself as well as the mattress that is on offer. Hyde and Sleep are a UK based mattress manufacturer who prides themselves on creating everything in house using their engineers and sleep scientists to make constant design improvements to their flagship products. It's common that many mattress companies don’t create their mattresses but instead purchase them from a large mattress factory and re-brand them. This is where Hyde and Sleep differ from much of the competition as they manufacture their products using their top-class facilities, machinery and materials. Because they aren’t purchasing the mattresses from a third party factory, it means that their overall manufacturing costs are lower which then means they can pass the savings onto customers resulting in a top class mattress at an affordable price. The Hyde and sleep mattress isn’t just a block of memory foam but has been crafted using many materials to create a 4-layer system that works together to provide you with a comfy sleep. Each Hyde & sleep mattress is covered in a lovely breathable material made from a Polyester and Elastane blend. This material allows for constant airflow in and out of the mattress. It also means that the cover hugs to the mattress for a better fit, while it can even be easily unzipped and washed on a low temperature so you can keep your cover clean and fresh with little effort. The cover also has the distinctive colour piping which is different from the usual bland covers that come with many other mattresses. The mattress is built with 2000 HD pocket springs which operate individually to adjust to the contours and shape of your body as you move within your sleep to provide balance and relieve pressure by distributing your weight effectively across the mattress. The top layer is 3.8cm thick traditional memory foam which provides support to your vital limbs and spine to provide comfort. Memory foam usually has the issue of overheating which can lead to lower quality sleep, but to stop this Hyde and Sleep have created their memory foam which has a cooling balm blended within to maintain a cooler temperature throughout the mattress. The middle layer is 1.9cm thick and is made from latex and memory foam which provides overall support to the two other layers on either side. It's incredibly essential for your back as it moulds around you when you’re sleeping. This layer gives the mattress more bounce, so you don’t sink too far into the memory foam. The bottom layer is made from high-density polyurethane foam base which creates 7 zones of airflow to ensure that you’re kept cool throughout the night. This layer also has supportive zones which relieve tension from the critical pressure points along the body. Ordering the product is as easy as buying a t-shirt, you navigate to their website and select your desired firmness and size. Once you have added in your delivery and payment details, you will then receive a payment confirmation, and your brand new mattress will be on its way to you. As we all have different working and life schedules, there are three different delivery options for you to choose from to fit your needs. The first is free next day delivery which is almost unheard of in the mattress industry. The second is next day delivery before 10:30 am which incurs an additional £25 charge. The final delivery option is for Saturday morning delivery before midday. They don’t currently offer time slot delivery, but they do send you regular updates when your mattress is dispatched. As you know, Hyde and Sleep deliver their mattresses in a sturdy yet compact box which makes it easier to move. It also has two carry handles on the top side of the box which also has the Hyde and Sleep branding etched onto the side. The size of the box is 50cm x 50cm x 105cm. With the mattress being boxed it means you can unbox it directly in the room where it will be used which means you don’t have to do the awkward and tiring carry through the rest of your house. You pull it out of the box and place it onto your bed frame. The mattress is within an airtight plastic bag which helps it to retain its compressed size so it can fit into the box. Once this has been removed, the mattress then springs into its original shape by sucking in air. Unlike many competing mattresses no memory foam gassing odour is usually given off. It’s recommended that you leave the mattress for many hours to get to its full size, but the Hyde and Sleep mattress did this extremely fast, and you could probably use this after just a couple of hours after receiving. It’s always difficult to believe that online mattress companies can deliver the same or better quality sleep as the traditional retailers on the high street, but it’s becoming very clear that this is, in fact, the case. When you lie on your back, you can feel the memory foam moulding around the contours of your body especially your back while also having low sinkage increasing the level of support with your weight being distributed evenly. This is where the pocket spring technology comes into its own especially if you have a heavier body weight which reduces the pressure points. If you're sleeping with another person, even if you're a heavier person the amount of weight motion transfer significantly reduces which will increase the sleeping performance of both people. The added pocket springs do make a difference and provide more support with the NextGen memory foam which feels soft and comfortable to lie on. One of the great things about the mattress is that in the mornings you will wake up feeling refreshed because of the long deep sleep that you have throughout the night because of the comfort of the mattress. If you have only ever slept on spring mattresses and this will be your first memory foam mattress, then it will take a few nights to get used to it however you will reap the added benefits of a better nights sleep. Our overall opinion is that this is a hybrid mattress that has a comfy medium firm feel but combines the benefits of a memory foam mattress with the added bounce of a pocket spring mattress. Surprisingly this mattress is also suitable for a range of different sleepers including back, side and stomach sleepers. The three-layer mattress construction proved added quality and comfort ensuring that your body is supported throughout your entire sleep, so you wake up feeling refreshed and not stiff, allowing you to attack the rest of your day with vigour and enthusiasm. The Hyde and sleep truly cater to all types of sleepers depending on your preference. 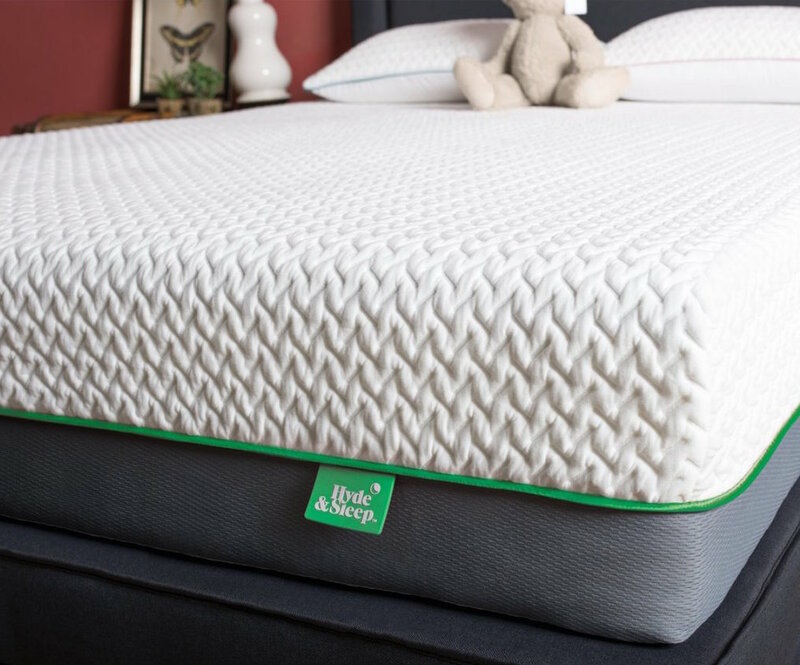 This version is for users who like to sink into the mattress, while still retaining the combination of pocket springs and NextGen memory foam to still relieve your pressure points from stress. The Hybrid plus Medium is the best-selling version and provides the best balance between softness and firmness. For those that enjoy the added support the Hybrid Plus firm has the comfort of the medium version but provides extra support within the layers for back support. Independent research has determined that a mattress should be replaced every eight years, so with this in mind Hyde and Sleep has offered a 10-year warranty against any mattress that is bought. This gives you the added peace of mind that if any faults develop within this time, then you will be entitled to a no-cost replacement. The 100 sleep trial is relatively common amongst the online mattress retailers, and Hyde and Sleep have followed suit. If you are slightly unsure about whether the mattress is right for you, then you can have 100 nights to test the product, and if isn’t for you it can be returned for a full refund. Delivery and returns can be made with for no additional cost to you so the price that is on site is the price that you will pay, with no hidden extra costs once you get to the checkout stage. If you share a bed with another person, then this is incredibly important as if the other person moves in their sleep you are less likely to feel any of this movement giving you a more consistent and uninterrupted sleep throughout the night. The Hyde and Sleep mattress is designed, manufactured and shipped within the UK so buying will be supporting a truly British brand. The quality of the Hyde and Sleep has not gone unnoticed by professional boards and organisations with it winning the Which Best Buy Mattress award. Which? is an independent consumer organisation which has millions of members which makes it a coveted award within the industry and gives the added seal of approval from experts. If you buy from their website store, they are often running ongoing promotions from free added extras such as their supporting pillows. This gives you even more added benefits to go with the already affordable mattress. For an online business, there are a large number of ways to get in contact with them, with the main options being phone and email but they also have integrated online chat where response times have been rapid which allows for simple questions to be answered in a small amount of time. It’s surprising that despite containing memory foam, when the mattress is first unwrapped the usual of gassing odour that usually presents was barely noticeable meaning that it didn’t have to sit in a room with the windows open for days on end until the smell was bearable, which is the case for many other memory foam mattresses. The mattress itself can be placed on any flat surface that you desire which means that it can be placed on a bed frame or directly on the floor. If you already have a bed frame, then the mattress comes in many different sizes from single up to Super King. The bed frame you use is incredibly important as you need to ensure that this provides support to the mattress; otherwise, you may not feel all the benefits. Of course, because this is solely sold online, there is no way to test this in a showroom before you make a final purchasing decision. However, with the 100-night sleep trial, this goes some way to almost making this a non-issue as you can test out the mattress in the comfort of your own home before deciding. The Hyde and Sleep mattress is one of the frontrunners in the UK mattress market with the combination of memory foam and pocket springs. With the 100-night sleep trial, ten-year warranty, excellent customer service and free delivery you have nothing to lose by trialling it and have a lot to gain with the improvement in your night-time sleeping pattern.